This thesis by Lotte Krabbenborg examines the challenges of having newly emerging science and technology (NEST) as a topic for deliberation in the public sphere, with civil society actors as new dialogue partners. This is studied in two complementary ways. Firstly, empirically, by studying spaces for interaction in which the actors experimented with a new division of labour, and secondly, by developing ideas about good spaces for interaction and their broader context, building upon the political philosophies of Dewey and Arendt, and then operationalizing the ideas in order to evaluate what happened in the empirical cases. The current discourse and experimentation with upstream public engagement can be seen as a bottom up experimentation with what could become a public sphere that enables deliberation on newly emerging nanotechnology as a matter of common concern. The analysis of interaction initiatives undertaken in this thesis demonstrates how more productive deliberation can occur and how sensitivity to the relevant issues can be enhanced. The cases studied in this thesis were one-off affairs in the sense that the projects did not receive follow up. However, other opportunities remain in our society – not least because of new innovation policies – for newly emerging science and technology to become a topic for deliberation, with civil society actors as new dialogue partners. The challenge we are facing is not that of how to have more civil society actors involved in research and innovation trajectories, but how their involvement can improve the identification and articulation of emerging indeterminate situations. Determining who should be involved and what types of interaction are productive depends on the diagnosis of indeterminacy and remains part of what has to be discovered and articulated. This thesis examines how to take up this challenge – which plays out at different levels – and how to do so in a more reflexive way. 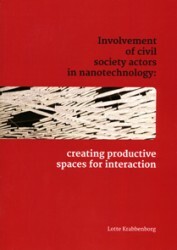 Dr Krabbenborg’s thesis: Involvement of civil society actors – Creating productive spaces for interaction (pdf file on rug.nl, last accessed 18 Dec 2013).